Why Be Curious? 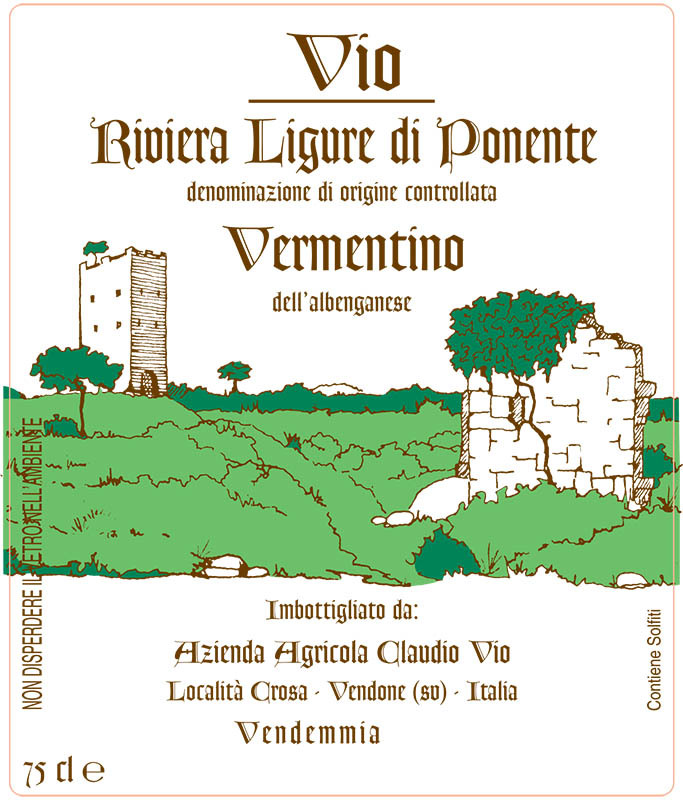 Vermentino grows throughout Liguria, but the best is in the “zona dell’ albenganese”, or the region around and above the coastal town of Albenga. Jancis Robinson’s Wine Grapes book says, “Morphological and DNA comparisons have clearly established that… Pigato and Vermentino are one and the same variety”, but Ligurian growers disagree. The grapes certainly don’t look the same in the vineyard, and the resulting wines taste different, even when vinified the same. The name “Pigato” comes from a dialect word meaning freckled and refers to the spotted appearance of the grape skins. Produttore / Producer: It’s here, in the tiny village of Vendone, 12 kilometers inland and 300 meters above the sea, that Ettore and Natalina Vio planted vines and olive trees amidst the mountain scrub in the 1970s. Their son Claudio and his wife, Maria Grazia, now tend the family farm. Vigna / Vineyard: A dispersed patchwork of tiny, terraced vineyard plots adding up to just two hectares — mostly Pigato, with a little Vermentino — yield just enough wine for us to bring in a few hundred cases a year. Cantina / Cellar: After manual harvest, the bunches are destemmed and crushed, and the must is left to macerate with the skins for 24-36 hours. Fermentation with native yeasts in temperature-controlled stainless steel tanks (18-20°C) lasts about 25 days. After fermentation, the wine spends 1-2 months on the lees without stirring them; a total of six months in stainless steel; and, a minimum of two months in bottle before release. Total production is about 750 cases per year. Il Vino / The Wine: In our experience, this is a Pigato that benefits from extra time in bottle. It’s often pretty wound up when it’s released and gets more expressive with bottle age. In good vintages, it also continues to age in compelling ways for at least several years. We’ve drunk five year old bottles that were spectacular. A Tavola… / At the Table… When the wine is young, use it as you would other Ligurian whites – that is, as an aperitivo and with fish and lighter vegetable dishes, including pesto). As the wine ages, it will stand up to stronger dishes (game birds?) and aged cheeses and becomes a candidate for a vino da meditazione. Nome / Name: Various parcels around Vendone, Liguria. Ettari / Hectares: 2 hectares spread out in small, terraced parcels. Suoli / Type of Soils: Loose gravel soils; slightest bit of clay. Vitigni / Varieties: 100% Pigato. Età delle viti / Vine age: 20-50 years old. Metodo di vendemmia / Harvest techique: Necessarily hand harvested. Metodo agricolo / Agricultural Technique: Manual weeding; Bordeaux mixture. Fermentazione alcolico / Alcoholic fermentation: 25 days (incl. 24-36 hours skin contact), 18-20°C. Fermentazione malolattica / Malolactic fermentation: None. Élevage: 6 months in stainless steel tanks + 2 months in bottle. Chiarificazione, filtrazione / Clarification, filtratration: Unfiltered. Zolfo / Sulphur: 80 mg/L total, 15-20 mg/L free. Produzione annua / annual production: 750 cases. Gradazione alcolica / Alcoholic %: 12-13%. Tappo e bottiglia / Closure and Bottle: Normacork Select Bio cork; 750 ml Bordeaux bottle.